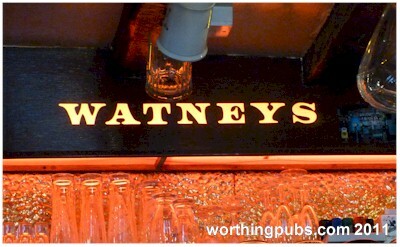 Probably the most well known pub in the area and certainly one of the oldest. 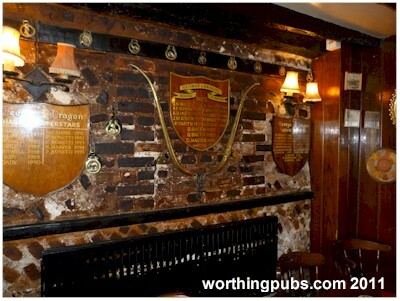 Thought to have been established in 1610 and run by Moses Brian, it was originally called The White Horse, becoming the George & Dragon in 1855. 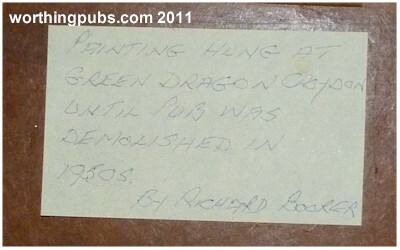 The pub has a smuggling history, something that was once rife in the area. It might be surprising, but most of the smuggling was actually the export of wool, the import of alcohol was a bonus! Above left, the Norris family outside the George and Dragon in around 1914. 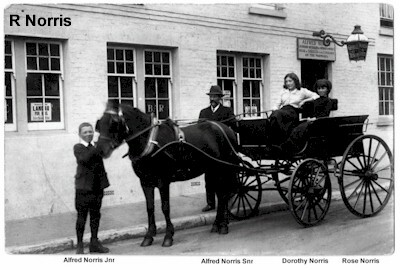 Left to right: Alfred Norris Jnr, Alfred Norris Snr, Dorothy and Rose Norris. As you can see, Alfred had more strings to his bow and included horse and carriage hire. Picture above: Undated but restored. 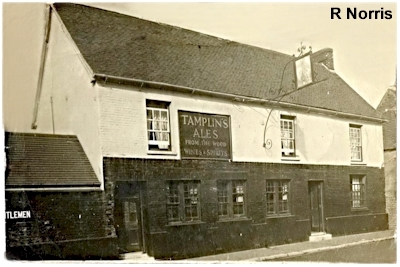 The sign reads: Tamplin's Ales, From the wood. Wines & Spirits. Although the picture makes the building look a little dull, it was probably painted a bright red. 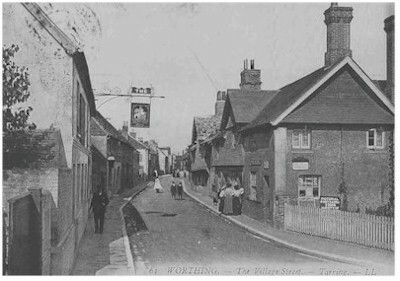 Left: The more familiar view of the pub looking north up the High Street. In 1967, during some building work, a 22ft well was discovered under the kitchen floor. 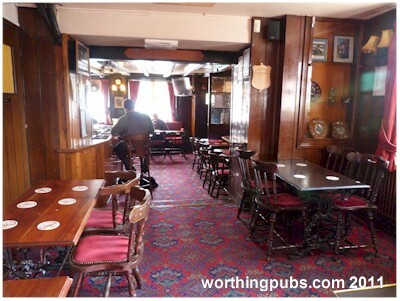 Richard Norris Remembers "Around 1860 Luke Norris takes over the running of the 'Castle Inn' from Frederick Street, with whom is a distant relation to Luke's wife Caroline. Luke dies about 1892. 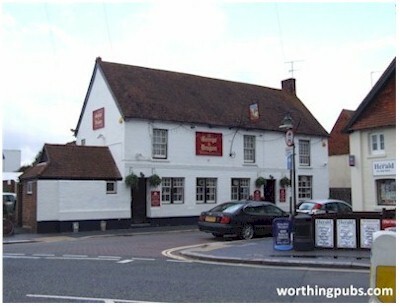 The Castle Inn is then ran by his son Alfred Charles Norris and he widow Caroline. Caroline dies in 1902. Alfred runs the Castle Inn until it's closure in 1911 - the license is transferred to Thomas A Beckett which has just been completed. Alfred who was also a Worthing Town Councillor was instrumental in getting the Thomas A Beckett built, using his council influence. 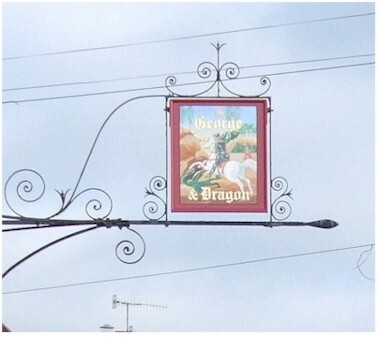 In 1909 Alfred is approached by Tamplin's Brewery about taking over the running of 'George & Dragon', he agrees which means he now runs 2 pubs with the help of his wife Emily and daughter Dorothy Norris. After the closure of the Castle the family move to G&D. Alfred runs the G&D until his death in 1936. His son, Alfred Charles Norris, (yes 2 of them) has no interest in taking over the pub, so Dorothy who has just married Albert Stanford then take over the running of the pub. The records will show Albert Stanford running the pub from 1938 till 1947 (his death) but in truth he was in poor health from the moment they were married. Dorothy Stanford (nee Norris) Glady Norris (sister) and Alfred (brother) all help out. 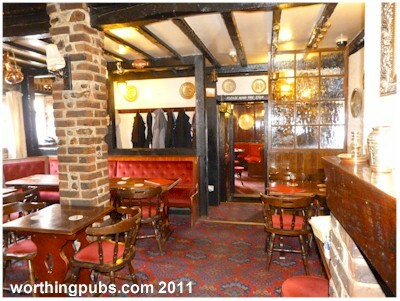 In 1947 Dorothy Stanford (nee Norris) continues to run the pub until the mid 1950's. After that I'm unsure who takes over the running of the pub, but I know it's outside of our family!" 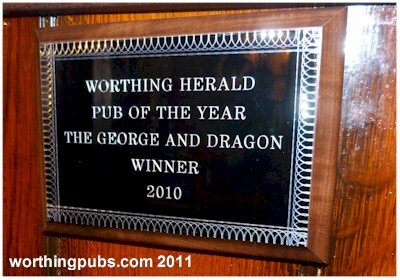 There is a Dragon at the George & Dragon, sadly the worst for wear. Just in case you wondered! The plaque is an insurance mark. It shows that the building was insured should it catch fire. 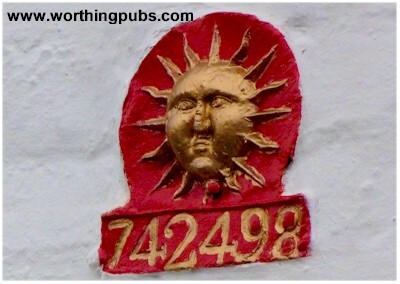 Without this visible symbol (many buildings didn't have numbers) the local fire brigade might not put it out unless it threatened a nearby building that was insured. The sign belonged to the Sun Fire Office and dates back to the 1700s. It is now part of the Sun Alliance. Got chatting to the young assistant bar manager as he was going around straitening pictures. 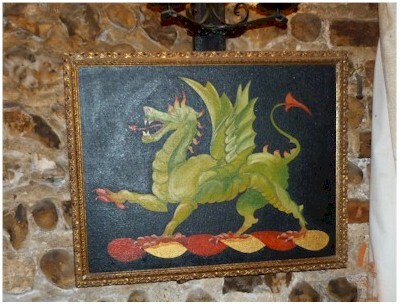 The landlord was off on his honeymoon apparently, and he brought my attention to this picture of a green dragon which I at first thought was a tapestry, but which in fact turned out to be a painting. He took it off the wall and showed me the reverse . . . 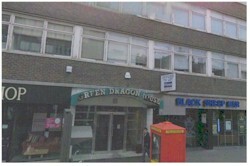 The original Green Dragon in Croydon was replaced with a block of offices and shops, though the new building is at least named Green Dragon House. A few doors down is a converted bank that now carries the old pub name. The 'George' , or 'G&D' as it is known locally, is a bit of a time capsule, where original brick and flint walls can be seen inside. The different floor levels remind you that it has expanded over many many years and dark wooden beams abound about the place. Many of these are later replacements, but originals can still be spotted. 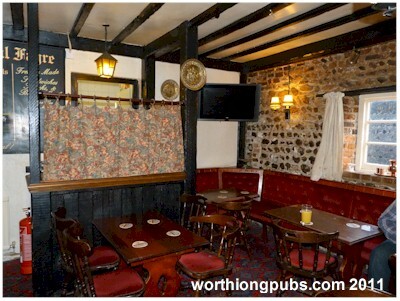 On entering the pub, you are greeted by the singular long bar with a recessed 'sports' bar (no pool table, just a dart board) on the left and a back room come diner on the right. There is also a cosy little corner tucked away. The back door leads out to a garden in three sections. 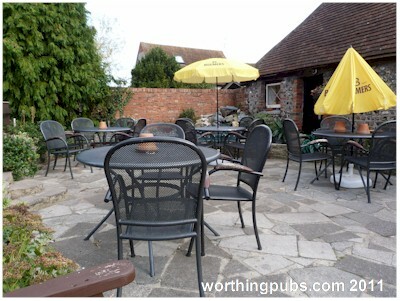 A real traditional pub, where you are made to feel welcome - and it's dog friendly too. It's somewhat unusual to have a pub sign displayed hanging 'up' rather than down but there is a good reason for this. Despite the High Street being one of the narrowest, it wasn't that long ago that double-decker buses ran a regular service past the pub.